Daring Cooks: Edible Containers ~ I Can Do That! This is one of the most fun Daring Cooks challenges and most delicious too. Thank you Renata for coming up with this brilliant challenge allowing us DC members to be as creative as much as we want. I love the crunch and saltiness of the cheese bowls and what could be better than a double dose of cheese. I love these for breakfast. Boil potatoes, whole and unpeeled, for 10 minutes. Let potatoes cool in the freezer for 15 minutes. Peel potatoes and coarsely grate. In a non-stick skillet, heat butter, saute onions until cooked, add to the grated potatoes with the salt, mix gently. Preheat oven to 425°F. Grease muffin cups. Spoon and press the potato mixture on the bottom and sides of muffin cups. Bake until darkish brown and edges are crispy. Remove from pans and fill. Korean cuisine has been a long-time favorite specially bibimbap I decided to make it vegetarian with tofu instead of beef strips for a change. Mix all sauce ingredients and let simmer in a small saucepan for 3 minutes. Remove 2 tablespoons and mix with the rice together with egg white. Line the bowls with plastic wrap and spoon 1 cup rice in each bowl pressing up the sides. Microwave, uncovered for 1½ minutes. Leave to set. In a non-stick skillet, add half tablespoon of oil and saute carrots until tender, transfer into a large plate and set aside. Saute the next 4 ingredients, one at a time, adding oil as needed and transfer into the plate separating each vegetable. Keep vegetables warm. Stir fry tofu with 2 tablespoons of sauce until sauce is absorbed and has thickened. Transfer into the platter; keep warm. Fry the egg yolks until the bottom is set and the edges begin to cook. Reheat rice bowl in the microwave for 1 minute. Remove the plastic wrap carefully and transfer the rice bowls into plates. Arrange the still warm vegetables and tofu in the bowls. Drizzle sauce all over. Top each with an egg yolk. Serve immediately with extra sauce on the side. WOW three containers I love the vegetarian bibimbap that is so unusual and it looks so delicious well done! Also I admire your photographs so clear and professional great job on this challenge. Look at the rice bowl, so awesome! These are not just palate-yummy, there are eye-candies too! YUM - all three of your containers look great! The mac'n'cheese has my name all over it (well, you know, figuratively...), and the hash brown cups look scrumptious. And the bibimbop looks so refreshing! Really, really wonderful job on all three!! The mac 'n' cheese must have magical powers because it is calling my name, too! It looks splendid! Such a great job on all three! 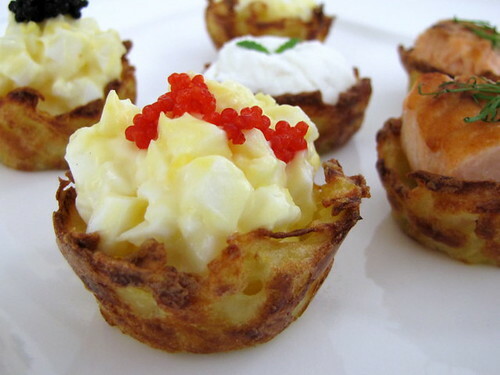 I love the mac 'n cheese with the cheese cup around it (get double the cheesy goodness that way :D) and the Potato cups sound great for breakfast, I'll have to give them a try. I like your idea of using the microwave to heat the rice and then let it set up that way. Did it stay together well? Love the Hash Potato Cups! I can't wait to try those potato cups. I almost did taro cups for my Lomilomi salmon, but thought they would get soggy. I would eat them all. Especially the mac and cheese. However that bibimbap is absolutely beautiful. Great work on this month's challenge. As a cheese fan, the mac and cheese in cheese cups looks amazing! And the potato cups worked beautifully! Thank you so much for sharing your creativity. Your creations are always so much fun to see, I only wish I could taste them, too! Love all your edible containers. I have your mac n cheese in my to do list. I'm thinking of making them soon! That bibimbap is genius because you actually do get the "tutong" w/c i love. Thanks for visiting my blog! OMG!! Totally blown away by your creativity! Love them all..the down home side of me the mac n' cheese bowls, the exotic side, the bipimibap! It's gorgeous! Beautiful, beautiful job! OH, loving your matcha adzuki bean swirl bread above..bookmarking that for sure! I thank YOU for being so enthusiastic at the forum and making such amazing dishes with edible containers. I specially love the bibimbap rice bowl, now that I'm living in Korea and have become familiar with this delicious dish I think it was very thoughtful! Thanks for participating! Great great job! 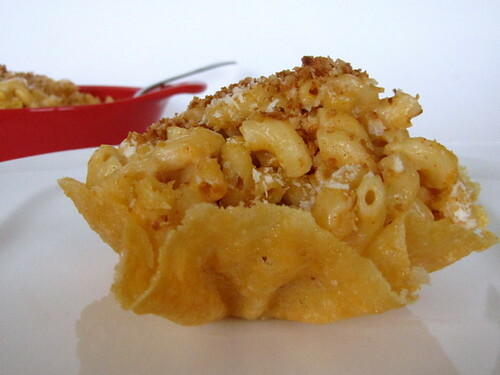 I love all your bowls, but I am particularly fond of your mac and cheese bowls! They looks amazing! !